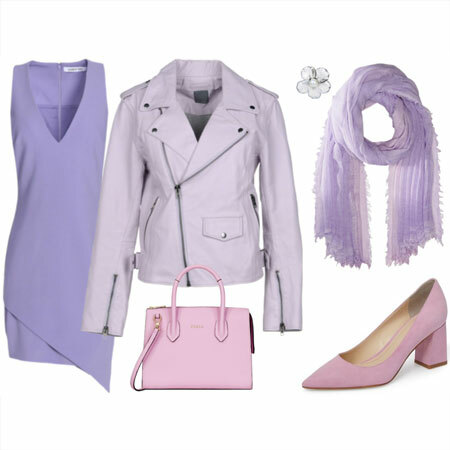 The Labor Day sales are a good opportunity to get a pair of transitional shoes to refresh your Fall outfits. Here are ten pairs from the Nordstrom Shoe clearance event, which is up to 40% off until mid September. Bed Stu Bonnie Bootie: It’s the unusual colours that make this bootie fab. We are going to see lots of black footwear this year, so stock up now if that’s not your thing. Runs a little narrow. 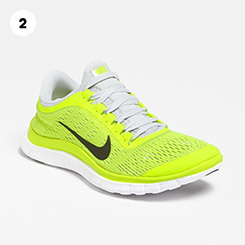 Nike Free 3.0 V5 Running Shoe: Throw on these heavenly comfortable neon darlings with a pair of black leggings, tunic tee, and oversized arty topper, and you’ve pulled together a fab little traveling outfit. Earth Dune Boot: Chunky, robust and comfortable. Read the rave reviews. Ivanka Trump Sasha Loafer: I nearly added this sweet shoe to my Summer footwear collection because it’s extra sleek, comfy and tailored. A true modern classic that is on trend. But I had already put my money into low heeled pumps, so I didn’t need more warm weather shoes. Warning: they are very flat, so you might need to pop in an orthotic for arch support. Dolce Vita Giya Flat: These are an affordable way of wearing 3.1 Phillip Lim’s designer loafers at a quarter of the price. Insert an extra cushioning insole and you’re good to go with the pointy toe trend. Jeffrey Campbell Rossdale Flat: Try cut-out oxfords if cut-out booties aren’t your thing. Might run a little small. 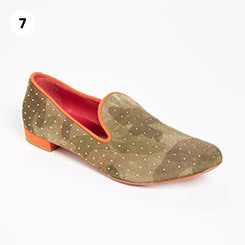 Alberto Gozzi Angelina Slip-On: Camouflage, studs and sporty orange stripes. Check out the back detail of these fun flats. 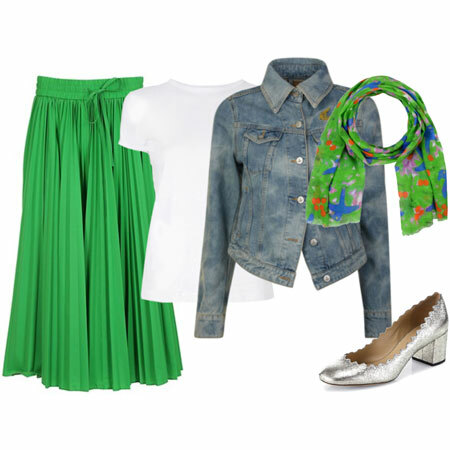 Halogen Bianca Wedge: A dear little comfy wedge with lots of personality. Nine West Callen Pump: Pink ankle strap fabness, and pretty comfy if you can manage the high heel. BCBGeneration Olga Pump: Looks fantastically modern and edgy on the foot with tapered trousers, skirts and dresses. The leather is not super soft and the toe box is a little narrow, but worth a try if you don’t have fussy feet, or sit at a desk for most of the day. Check out the sandal sale if your Summers are long and your Autumns hot. Wear them with jeans and trousers for seasonal coverage, and continue showcasing pretty toes for a little longer. Links in this post generate commissions for YLF. #7 is to die for! But I am so unstylish, ow would you where them and with what color combos. The color throws me completely. I also love 7. I would wear it with boyfriend jeans, pants and I would try them with a casual skirt. Ha – thought 7 had polka dots – but they are tiny studs! How cute!! No one will miss you in neon sneaks. Spot on, merwoman. Dale, #7 will look great with tapered jeans and warm neutral tops and toppers, thereby picking up the colours of the pattern. Or blue tops and toppers, as orange is the complementary colour of blue. Or white. Never underestimate the power of shades of white. I am drawn to the first pair of booties. I love the color shown in the pic and developed a thing for booties last winter that I think will continue into this one. My tall boots rarely get any action. It was a good run though. I love those Ivanka loafers. If they fit, those will have to follow me home! 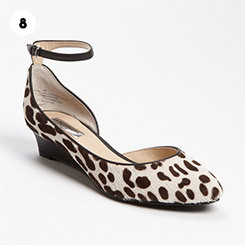 I’ve been resisting the siren song of those dalmatian print Halogen wedges for a while, but just caved in. They’ll fill a gaping hole in my transitional footwear wardrobe. Thanks for the push. I like the Bianca wedge too! Sorry, Angie but posts like this are very frustrating to me. I have narrow feet, so nothing shown will fit me (except possibly the boots). I am so tired of looking at pretty heels and flats that I can’t wear. Even Nordstrom’s selection of narrow shoes is limited and the narrow styles available at Zappo’s are usually either “old lady brands” or not in my budget (Stuart Weitzman shoes are pretty, but pricy). MRL, if only there was a larger selection of footwear for feet that fall outside regular and average length and width specifications. I don’t have narrow feet, but they are low volume, which makes most sandals impossible (plus I just don’t find them comfortable). And trying to find dressy boots for narrow or very wide calves is another very tall order. And petite tall boots are extremely hard to find, especially when you have a large foot for your short height. I hear you on how frustrating finding footwear can be. The only thing I can suggest is that you scour the sales and save up for Stuart Weitzmans at reduced prices – if those fit the bill. Rather spend on one pair of shoes that are killer, than multiple that are just okay. Some great picks here. 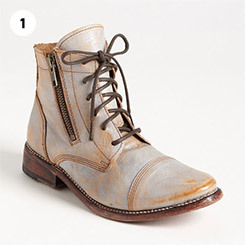 I just ordered the Sam Edelman ‘Jayden’ Oxford’s to try out. I like the cut out design, but you can still wear a foot ped with out seeing them. I think they will work well my darker bottoms as we move into cooler weather. Those Halogen Bianca wedges are really cute. Too bad my size isn’t left in them. I bought the Dolce Vita flats in black today. They were not on sale but I love them. Pop some insoles in and I am good to go. Thank you Angie this was very helpful. The Halogen wedges (SO cute!) and the BCBG’s really have my eye. Well, and of course, the red flats are IT for me, too. I guess all shoes are good, really! Time to sort the closet…. I love the Bonnie Bootie and think I could wear this into the fall, but would it be appropriate for winter too, or is it too light? What would it look good styled with, other than BF jeans? Oh my! Those Rossdale oxfords are screaming at me. Love, love, love.